Winter conditions on Tuesday caused incidents on Moira St. West. Photo by QNet News reporter, Lindsey Cooke. 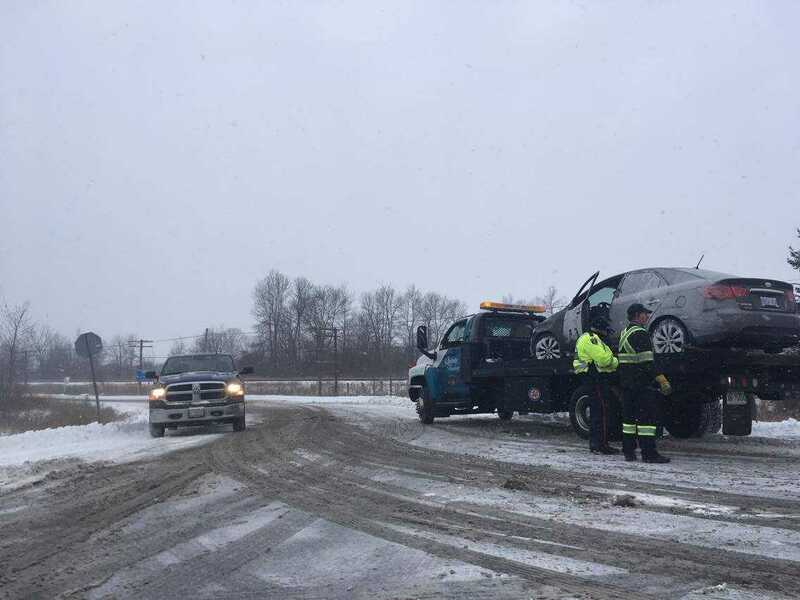 BELLEVILLE – Close to 500 accidents and six fatal collisions have occurred on a 150-kilometre stretch of Highway 401 between Kingston and Port Hope in the last 12 months, according to the Ministry of Transportation. On average, it is over one accident per day on a major corridor in Eastern Ontario. This represents 1.4 percent of all traffic accidents in Ontario. Napanee OPP office Constable Juliane Porritt said this is significant. OPP and the Ministry of Transportation are cracking down on one aspect of the problem in a province-wide campaign aimed at distracted truck drivers will be taken seriously to keep families and commuters safe along Highway 401 in eastern Ontario, said News release released Friday about safe driving. The ministry, local officials and the Ontario Provincial Police held a press conference to launch the initiative on Friday in the hopes of improving commercial vehicle safety. These include all vehicles used for transporting goods. Porritt said is it common for accidents to happen on the 401 and that there have been more reported collisions lately in our area. “Napanee OPP covers 88 km of the 401 in our detachment area which includes Quinte West,” said Porritt. During this winter, Ontario will be conducting vehicle enforcement blitzes to search for aggressive or distracted driving, mechanical fitness and the safe transportation of dangerous goods. According to Transport Canada, the federal regulator, transporting of dangerous goods will be undergoing an update by the Canadian General Standards Board. This includes anything that can be a danger to the person transporting the goods or a danger to the public. The new update is set to help drivers make safe and informed decisions during the winter driving conditions. This updates the driver with safe travel routes and weather conditions in the area. Ontario will also be adding more electronic signs along Highway 401 to help provide up to date information to all drivers about the current weather conditions and whether or not they should be making alternate travel plans. The signs will be placed along Highway 401 from Port Hope to the Quebec border. A new pilot feature called Forecasted Driving Conditions is available for Ontario drivers on Ontario 511, the feature predicts driving conditions based on the forecasted weather and weather conditions outside, giving people insight and information on traffic and driving conditions. Porritt says that drivers who commute regularly should slow down, pay attention and leave lots of room for breaking.